The Arlo Q is a 130-degree 1080p indoor security camera, with 2-way audio and a night vision mode. 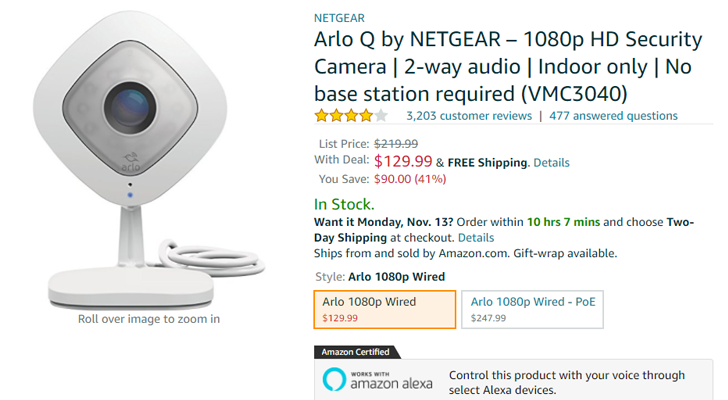 It supports Alexa, but not Google Assistant (you can connect Arlo to IFTTT for some level of integration, but not full functionality). If you have an Echo Show, you can even view the camera feed with a simple voice command. Outside of voice assistants, you can obviously use the mobile app (or a web browser) to view a live feed and browse recordings. You can store up to 7 days of footage in the cloud for free. Unlike the Arlo Pro line, the Arlo Q connects directly to your Wi-Fi network and doesn't require a smart home hub. You can buy it from the source links below.